Quinlan School of Business » Old Age Ain’t No Place for Sissies! What I’m posting here is the script that I prepared for a radio show on WGN – The Download with Justin Kaufmann. Every month I join Justin as the “Resident Philosopher” of the show and we discuss a topic of socio-political or philosophical importance. In March, we tackled the benefits and problems of aging. I hope you find my script comments and quotes are of some interest and use to you. But, it is also not a punishment, a penalty, or a curse. Old age is not just the sum of our disabilities. It isn’t just a prolonged “death sentence”. It’s not just a daily “organ recital” – old age is a perk! And, you only get it if you’re lucky. Aging needs to be seen not as the end of life, but as another phase of life – a phase that has its drawbacks but its opportunities too! Age doesn’t necessarily result in wisdom and insight. Aging does not necessarily heal all wounds. There is no one formula for aging well. Aging for most of us is a foreign country with a language unknown to us until we get there! Too many of us view aging with fear, despair. “A post script to life”. Years of education. The more years of schooling people have, the more they tend to age successfully. Bottom line, health is a component of happiness, but not always the only component. John Leland (Happiness is a Choice You Make) is not a given, it’s an artifact. You have to plan and work for it. True, old age is a “gift” that keeps on taking! The Q is: What are you going to do about it? Without meaning, life is not endurable. Without meaning, there is no purpose. But meaning and purpose need not be “rocket science / brain surgery” – It can be pedestrian and parochial. (A child’s smile, a sunny day, a chance to see a loved one/friend, less pain today than yesterday, a good book. We must choose happiness amid other options! Life is relative. The only Q is: Right now, are you happy? Why is this topic critical today? Because: Demographics is Destiny. How do we address, as a society, our new aging population? Today in America – approximately 14% of population is over 65. In 1900, average age was 47. Today average age is approximately 76. Not only are more of us living than ever before, more of us are living longer than ever before. Moreover, as boomers age they are seriously altering the age range of the nation. In 2020, people over the age of 65 will increase from 35 million in 1995 to 53 million. In 2026, people over the age of 85 will increase to 9 million from 4.2 million in 1999. And by 2020, senior boomers will make up more than 18% of the U.S. population – the same proportion as in Florida today. Today – 6 million and counting! Only 11% in nursing homes; 70% take care of themselves. How do we address this growing and diverse demographic group? Part of it is not seeing age or a sentence, a penalty, but a lucky peak. In the 1930s, H. L. Mencken lamented that after you’re 40 years old, it’s all over. “The best years are the 40s,” he said. “After that, a person begins to deteriorate. But in their 40s, people are at the zenith of their energy and vitality.” For Mencken, 40 meant middle age, and middle age meant crisis, breakdown and the beginnings of old age and death. Myth I: People over 65 are old. Older people are chronically in poor health. Older minds are not as bright and flexible as younger minds. Older people are undependable and unproductive. Older people are unattractive and sexless. All older people are pretty much the same. All older people lost their passion for life. According to Journalist Gail Sheehy, we need to rethink the new “old age”. According to John Leland, happiness is a choice we make. When you think about it objectively, why is “old age” automatically a curse, and “youth” always a blessing? Every age has its crises. Every age has its problems. Every age has its highs and lows. Personally, I believe that thirteen to thirty are the toughest years of all. Think about it. And, let’s not kid ourselves, the middle years – thirty to sixty – aren’t necessarily all that glorious either. The point: youth may be glorious! But it is also painful to endure. Why can’t “old age,” our “second adulthood,” sixty years and counting, be a time when – liberated from the pressures and hang-ups of a youth-oriented society driven by work, status, and success – we find relish in existence and search for a deeper meaning for life? Why can’t maturity represent the highest point in human development? Why can’t “old age” be our “Sabbath days”? Days of rest, reflection, the pursuit of insight and wisdom. To overcome our fear of irrelevance. To let go of our fear of failure. To let go of the tyranny of the dream, the tyranny of false expectations. To pack away illusion, false hopes, excessive desires. To see that we are not in this alone. Why can’t we see age as healthy growth, as a part of the continuity of life, as an opportunity for wisdom, and not simply as the vestibule to death? Learn the lesson and walk away from the pain. See beyond unimportant parochial particulars. Let go of some of our self-serving egoism. No longer always have to worry about self-aggrandizement. No longer be solely involved in careers, status, and success. Be open to the possibility/reality of change. Be non-threatened by the needs of others. Be open to different life lessons. Give up most of control. Abraham Maslow once suggested that that wisdom was the accumulation of knowledge and experience, and then living long enough to reflect on it, make sense of it, and apply it to oneself and others. Age and wisdom may not necessarily be connected, but age is a necessary condition for the achievement of real wisdom. Maslow is not suggesting that “younger people” cannot be smart, intelligent, or clever, but rather that wisdom and insight require time and fermentation to develop. We can choose the quality of our own aging process. 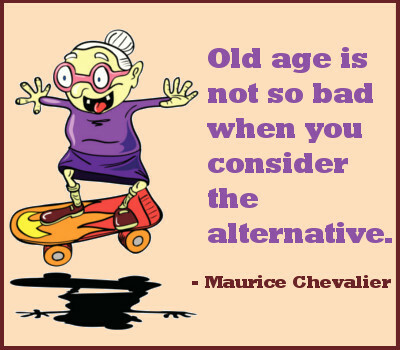 Decide what you want to be when you get old! When you are old, you are have to make yourself happy. Otherwise, you get older! Don’t just lament what you can’t do! Do what you can! Time is limited, enjoy yourself. Age can equal less stress. Remind yourself: happiness is not what it was, but what is happening right now. Happiness is about living in the moment. Money helps, family helps, support helps – but in the end happiness is a choice. What choice do we really have regarding aging? Let go of the “tyranny of the ‘still’” – I “still” can do this! I “still” can do that! Stop clinging desperately to the past! Give up the myth of control. Old age is not a personal affront. It only happens if you’re lucky enough to live long enough. Be grateful! Life is a gift. Gratitude is the most common feeling individuals who are enjoying or at least accepting their old age! Remember: no one is “entitled” or “guaranteed” anything in this life! Say “thank you”, be “thankful”! You can’t go back. Let bygones be bygones! “Age” or “aging” is an arbitrary nomenclature, a variable that is subject to the widest cultural interpretations. For example, all of us know people who were young at heart well into their nineties, and others who were cranky oldsters in their teens. My own mother once called me “the oldest, crabbiest man she had ever met.” She did it at my eighth birthday party right after I criticized the quality of the decorations and the party favors – think Frasier! Age and aging are basic facts of life. The psychologist Seymour Littallek warns that we have a personal duty and social obligation to respect and honor the concepts of age and aging in regard to both ourselves and others. A society that does not provide sufficient gratifications for the elderly will be an unhappy society for the young as well as the old. If the old are not gratified, nobody can accept the prospect of age with equanimity…for any society which cannot treat its elderly members decently is doomed to unremitting despair and chaos. Let’s end with Tribune columnist, Eric Zorm’s (a youthful 60 years old) “14-Point Plan to be a Good, Old Man”.